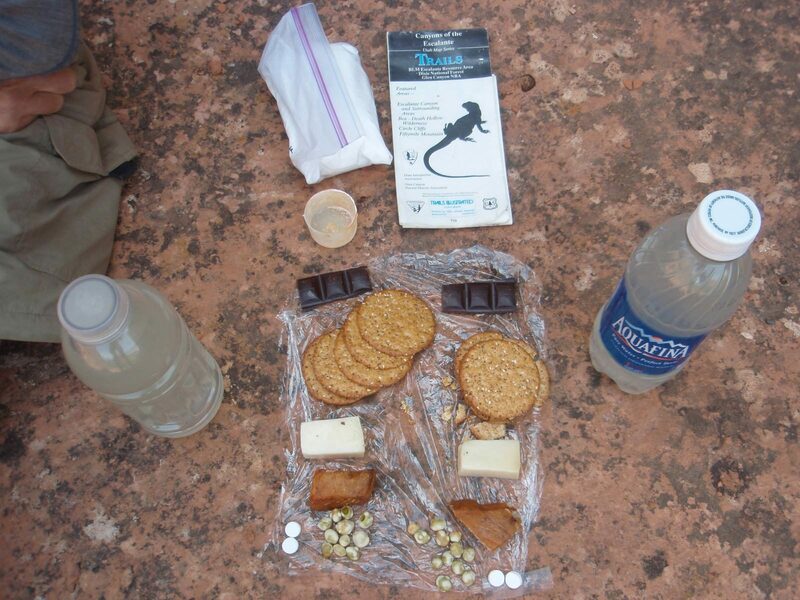 We had previously taken eight backpacking trips in the Escalante River corridor. 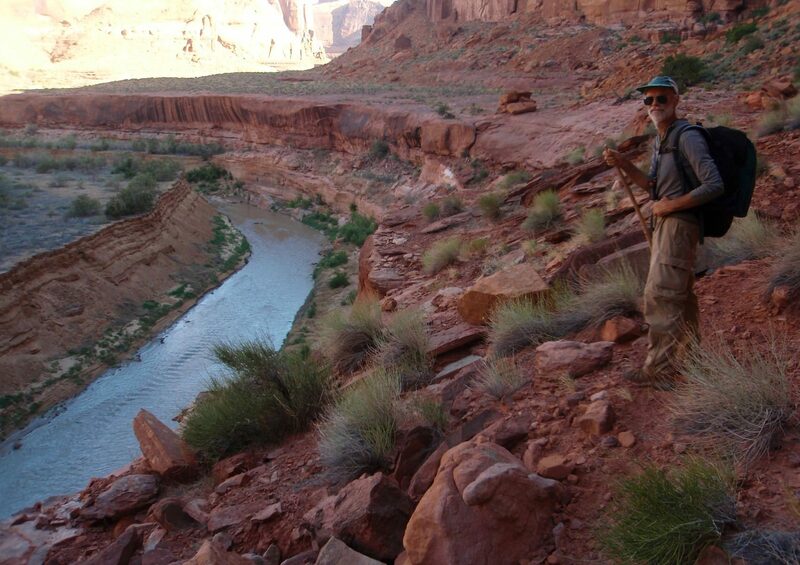 On each of those trips we focused on one region, ascending each side canyon system to the points of impasse and seeking routes from the canyon floor to the rim. 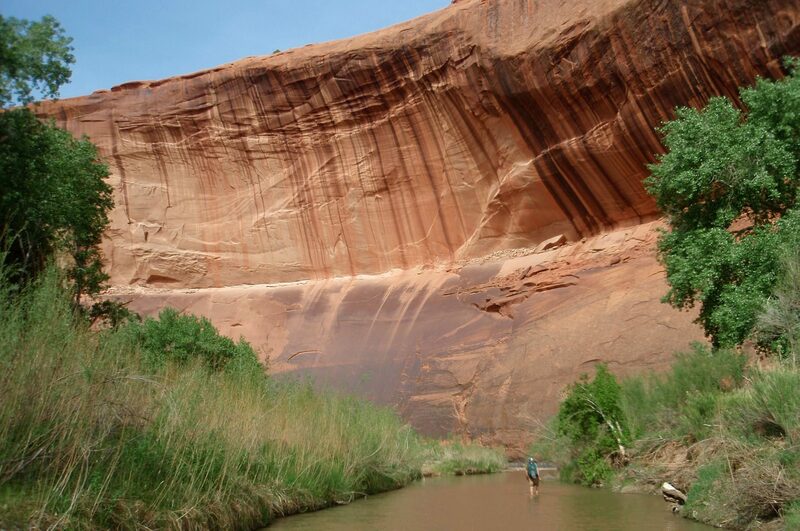 On this trip we wanted to traverse the length of the Escalante River all the way from the town of Escalante to the backed up waters of Lake Powell. 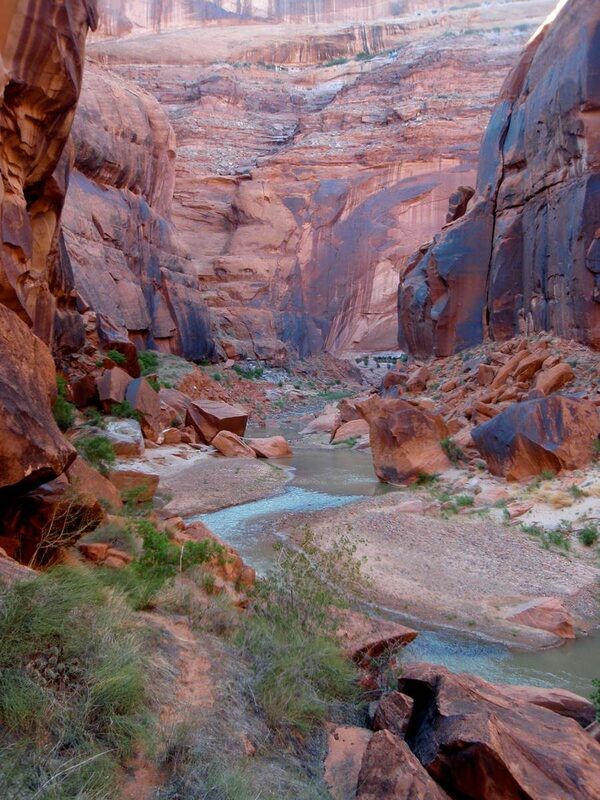 Because Powell was at an historic low water level, we hoped to be able to visit a side canyon which was previously almost inaccessible to hikers. 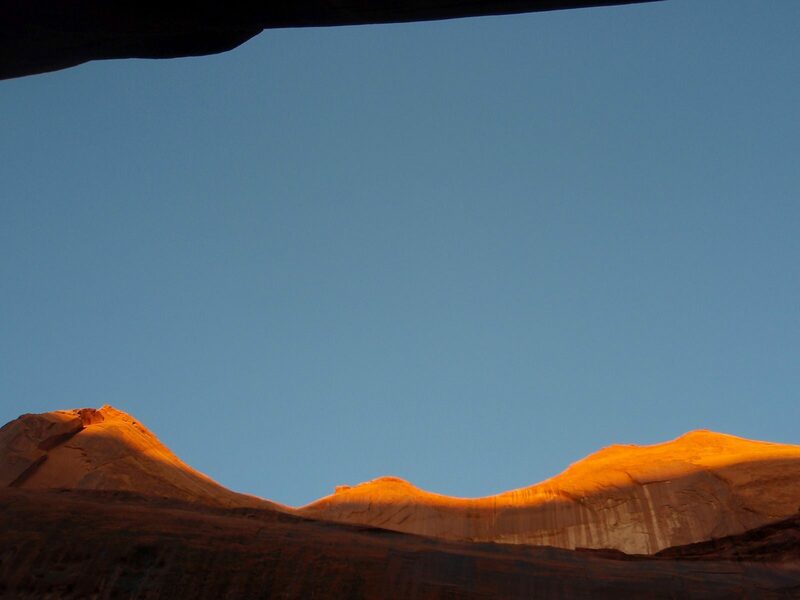 Canyoneering 3, Loop Hikes in Utah’s Escalante, by Steve Allen, is the best hiking guide for the region and includes detailed descriptions of hikes for backpackers at all skill levels. 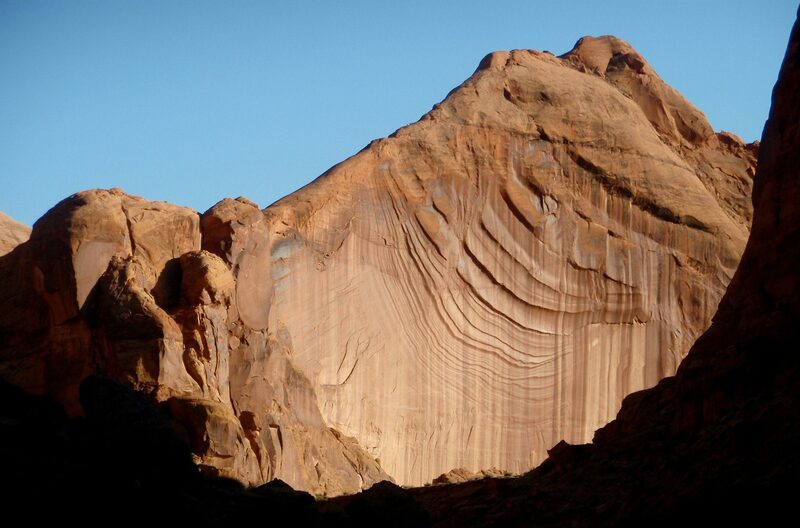 Canyons of the Escalante, Grand Staircase-Escalante National Monument National Geographic Trails Illustrated Map covers the entire route. 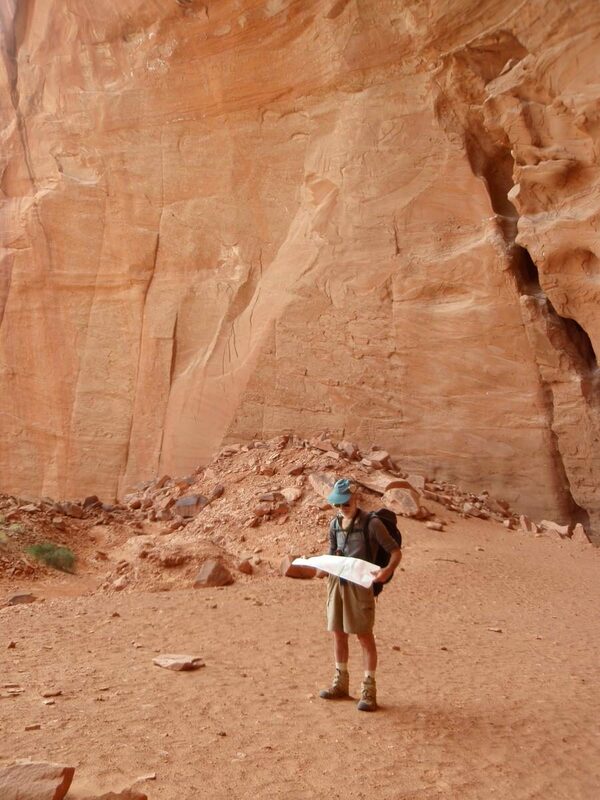 It is a good overview, but is not as detailed as the 1:24,000 USGS maps that we print using CalTopo. Grand Staircase-Escalante National Monument BLM site, NPS site, and wiki page. 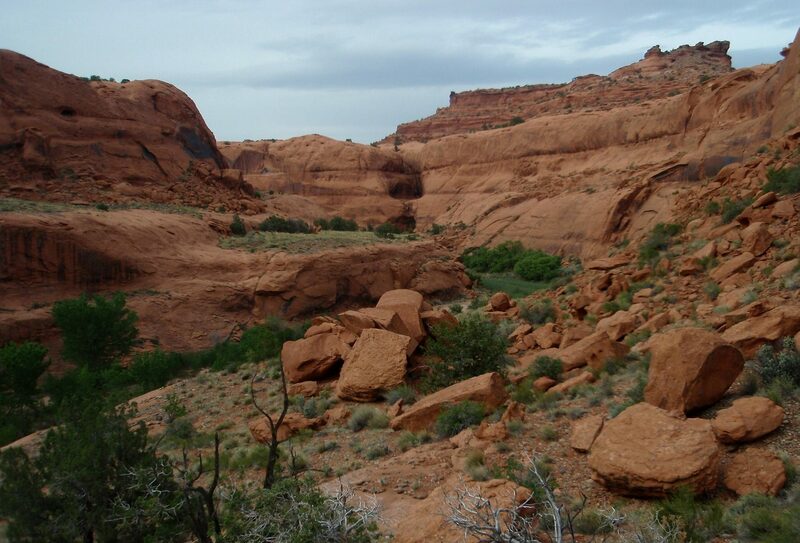 Southern Utah Wilderness Alliance has worked for decades to defend Utah’s redrock wilderness. 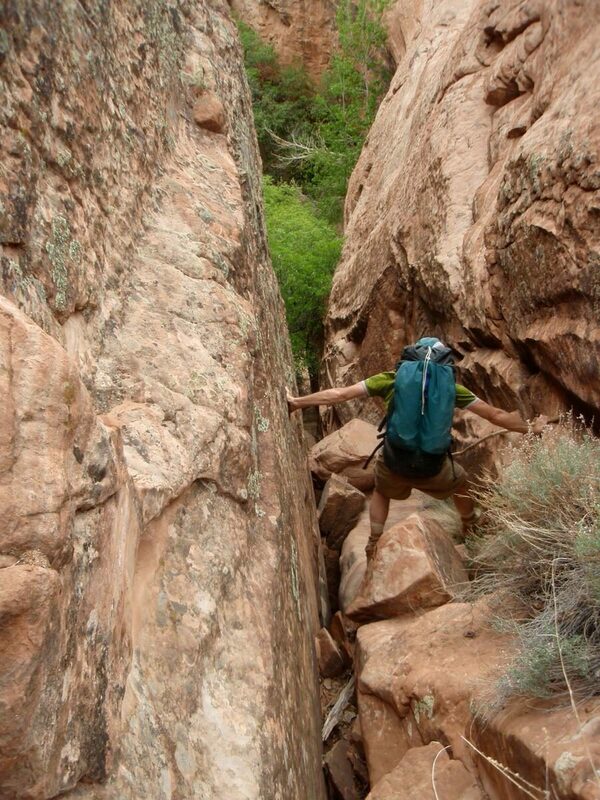 Dropping back into the canyon. I love my ULA pack. Camp #3. Maybe best photo of the trip. Half day side trip up Silver Falls Creek, a canyon we had never visited. Mostly dry, just a few seeps. 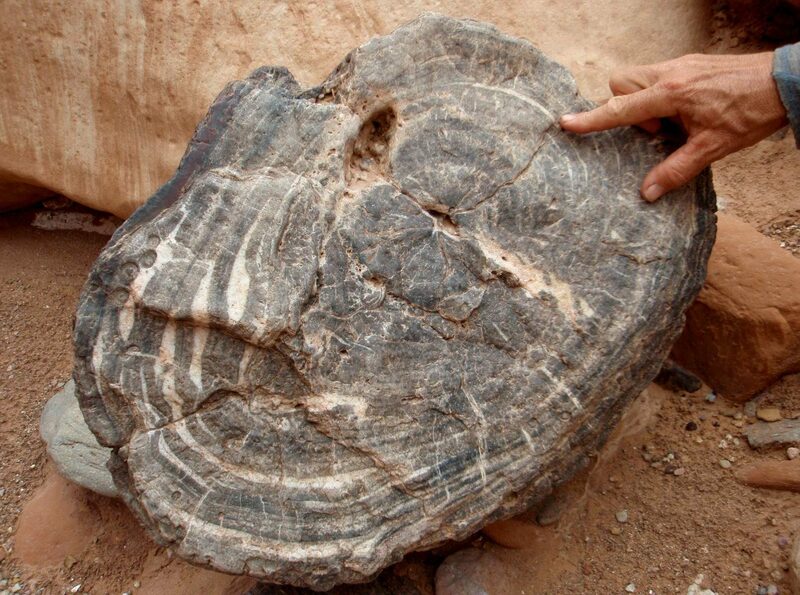 Petrified wood is common in the Chinle formation. Silver Falls Creek enters this formation, which lays below the Navajo, Kayenta, and Wingate – the three formations that dominate the rest of the trip. Really big alcove above the spring in the really big rincon in Silver Falls. 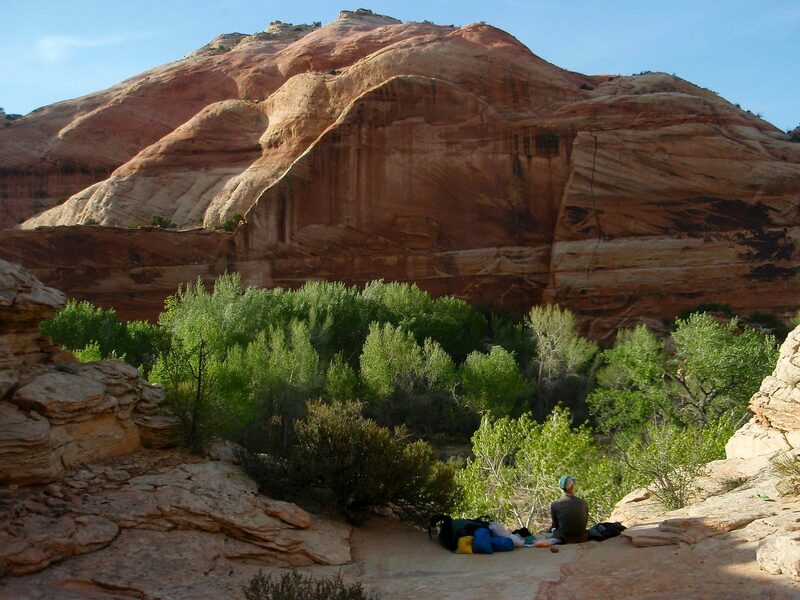 Jim at dinner table, Camp#4, looking out over the Escalante River. Camp #4. 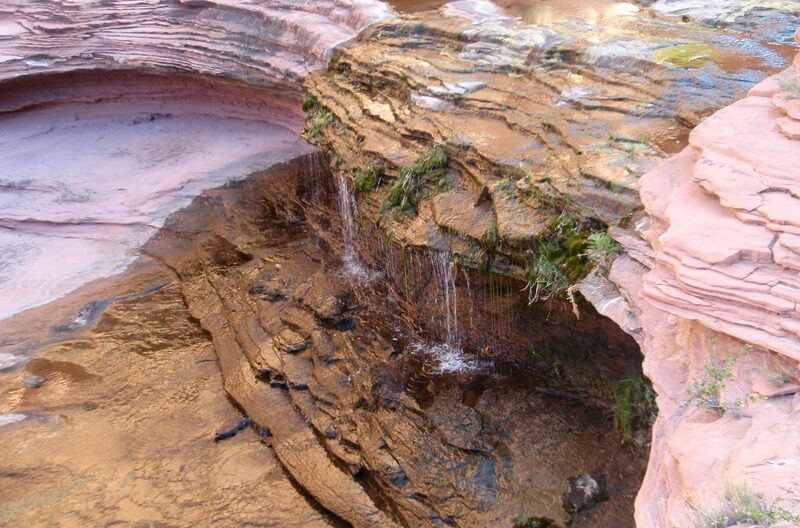 A stellar place just 15 or 20 vertical feet above the Escalante River. Heading up popular Neon canyon. Pretty good flood deposited that pile of stuff up there. Camp#5. 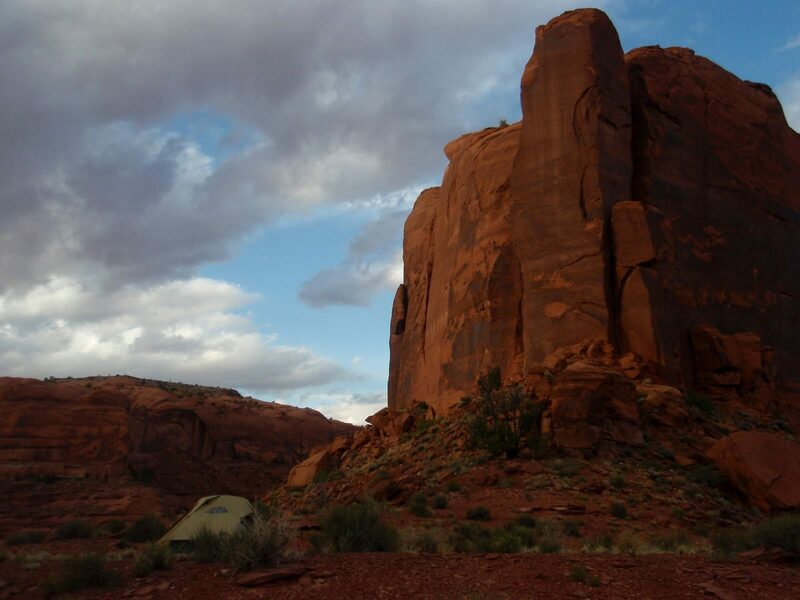 The tripod rock beyond the tent was my single favorite thing of the trip. The old river pebbles form a bed under the tripod mushroom. The view from Camp#5 dinner table. Jim gathering water from a spring. Bathtub rings are very visible. View from dinner #9, late afternoon light. Morning Day#10. 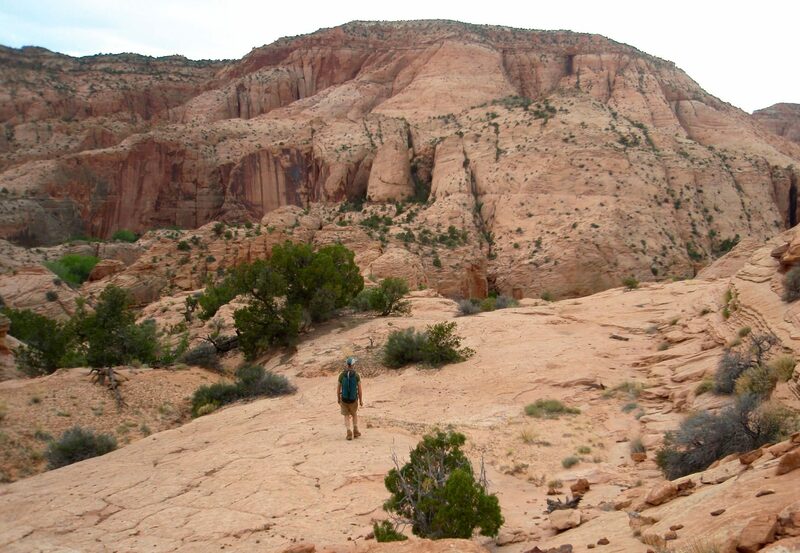 We’re on top of the saddle that separated our side canyon from the Escalante. We’re standing a few feet above max pool level. Looking up-river. Look at how deep the delta-silt is. The river has filled it’s flood-plane. The water is a couple feet higher than it was 36 hours ago, the snowmelt has arrived. It’s not possible to cross the river when the water is this high. So we are travelling upstream several miles while staying on the east side of the river. 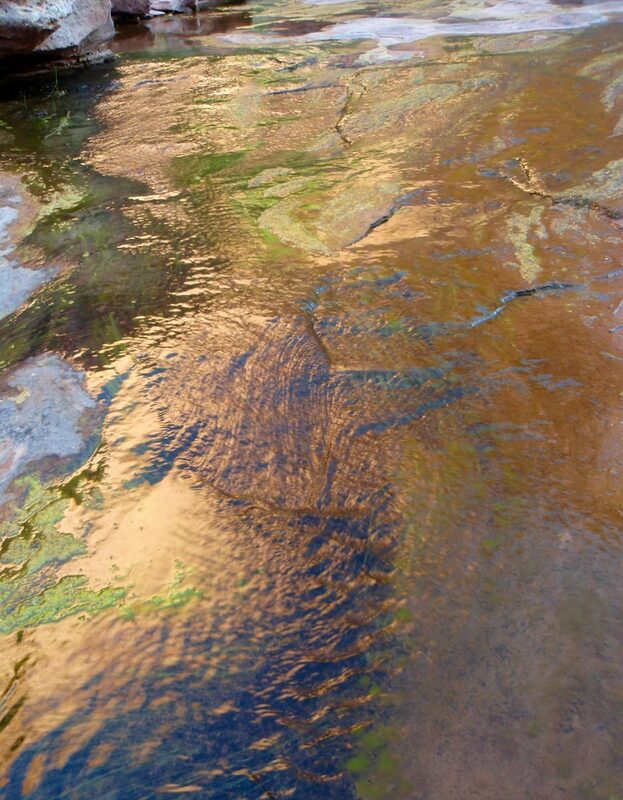 The high water is complicated by the fact that the further downstream, below max pool, you go the finer the delta-silt becomes, which means knee deep muck on the banks and in the river bottom. Muck is not fun when the water is a foot deep. But when the water is three feet deep, the muck is dangerous. 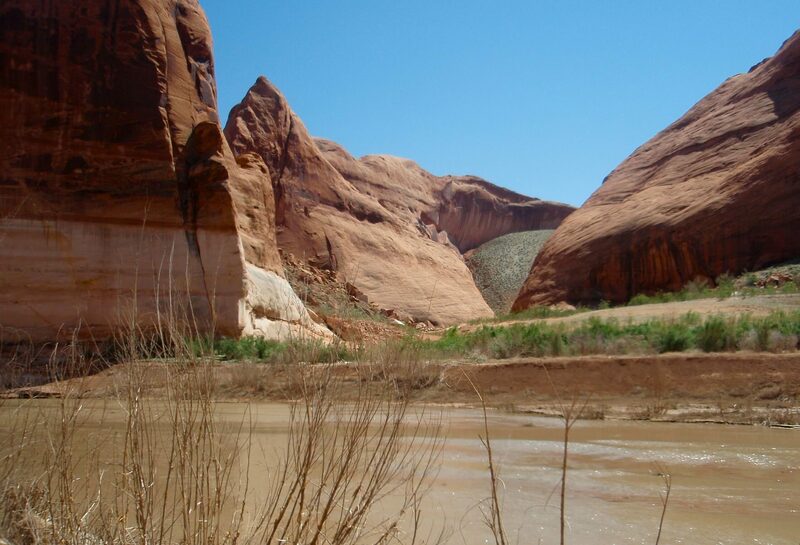 In 1984 we took our first joint trip to the canyons of southern Utah; we visited a small part of the Escalante River, including Choprock and a few other nearby side canyons. I thought that was perhaps the most beautiful place on the planet. 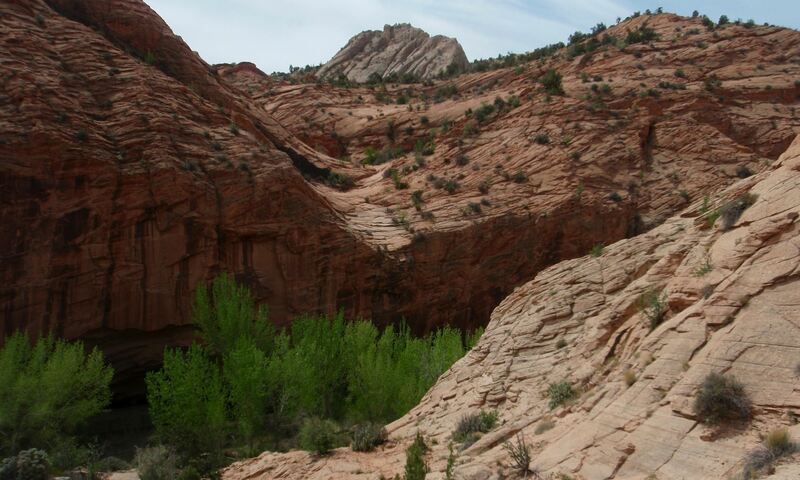 Over the years I came to realize that most of the side canyons of the Escalante fit that description, as do many of the other canyons of the Colorado Plateau. 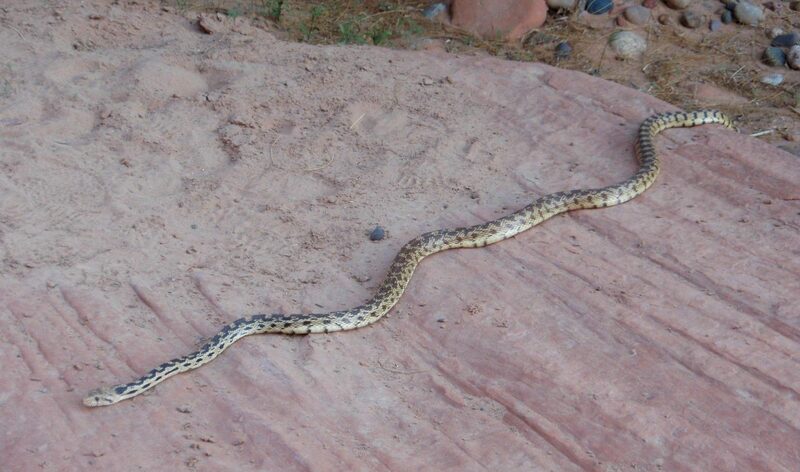 On this trip we spent much of our time traversing the length of the river and less time engaged in free-lance exploration. 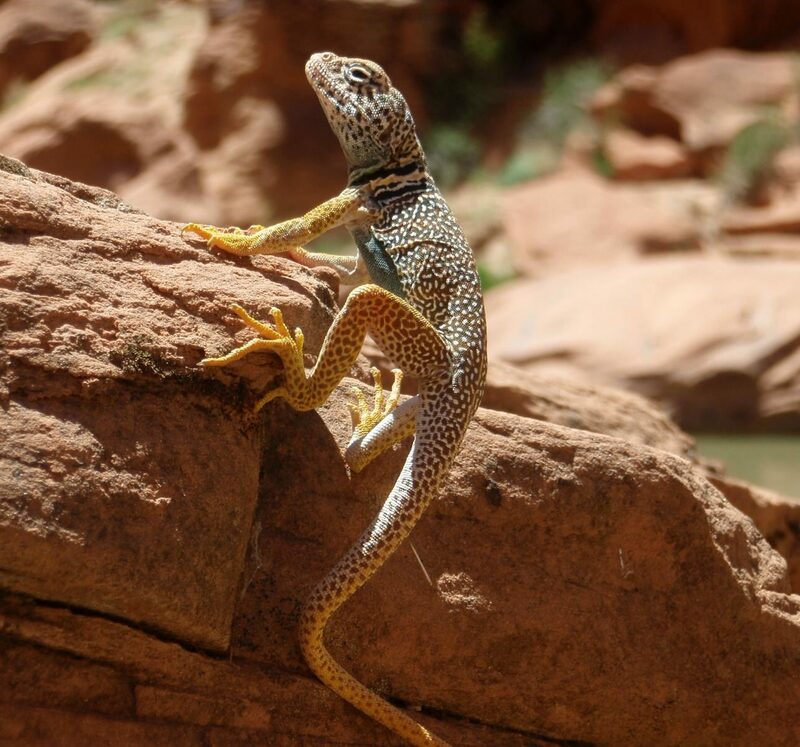 If one were to take only one trip in southern Utah I would recommend picking a small area and exploring it in great detail. 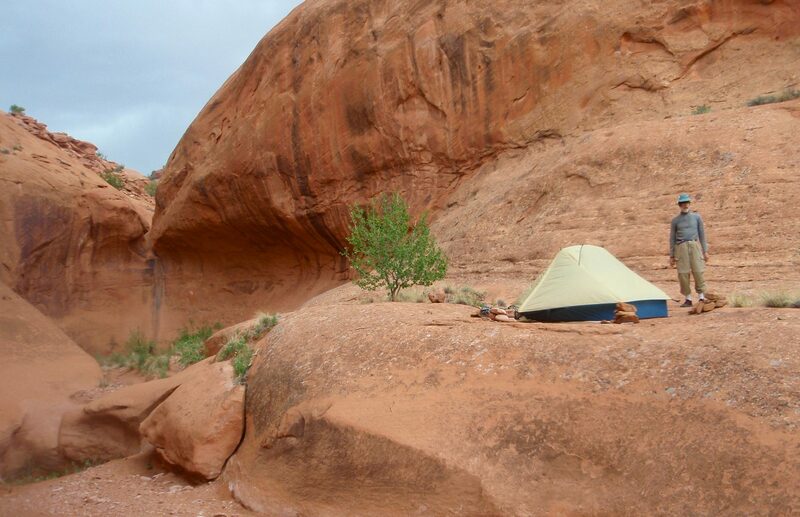 For us, having been there many times, I got great satisfaction from thru-hiking the entire stretch and seeing how all those side canyons we had previously explored fit together. I had erroneously thought that we had already seen the best parts, and that simply because the upper reaches were closer to town they would be somehow less interesting. I was wrong; every mile of it was good. 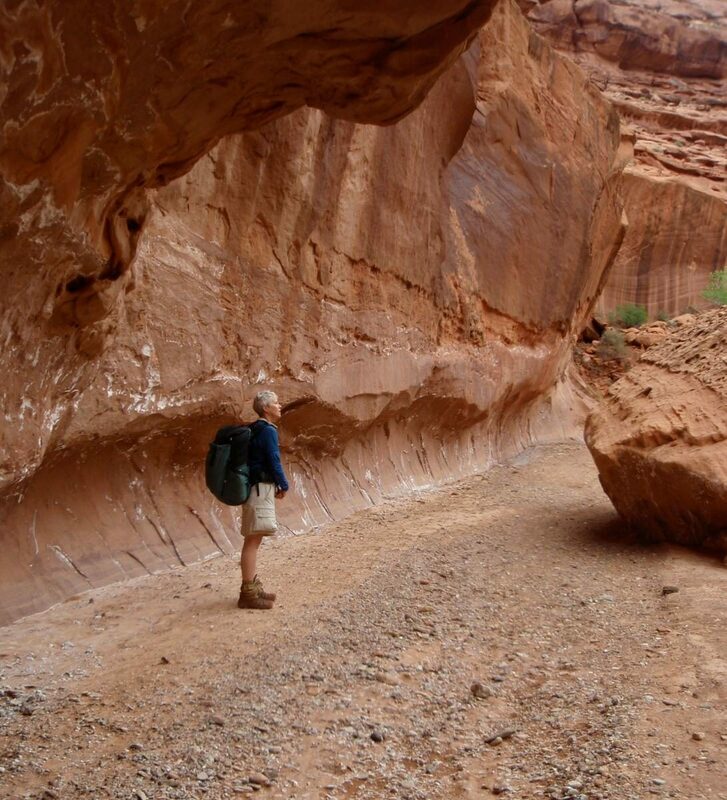 Traveling through the previously drowned portions of the Escalante was encouraging as the damage done by Lake Powell looked reversible. 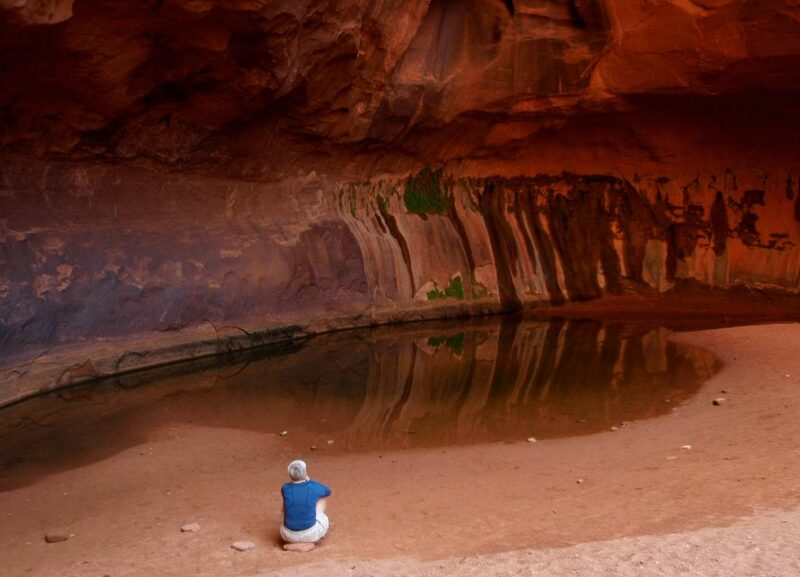 When the Powell is finally drained, either by enlightened human action or lack of water due to ongoing climate change, given some time, Glen Canyon will recover most of its former glory. 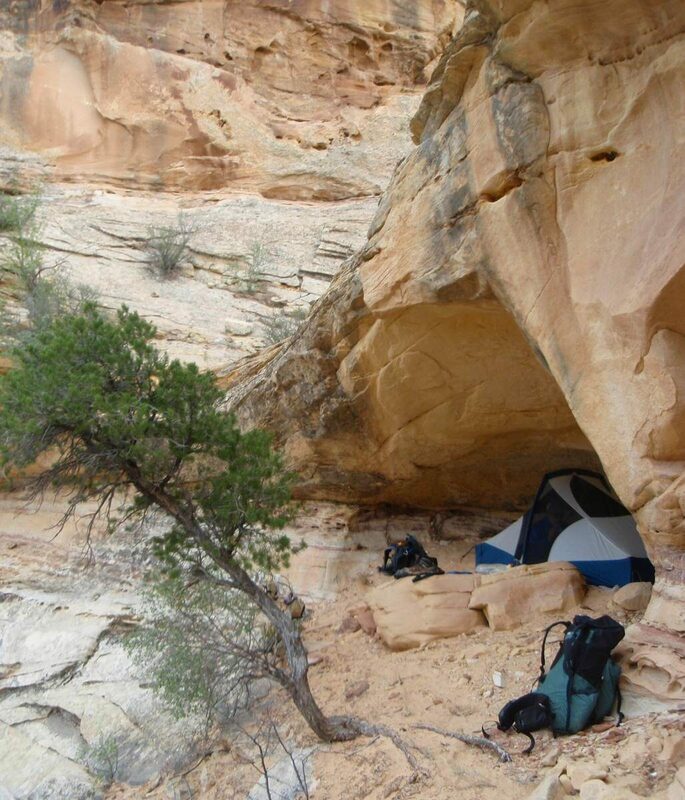 Do not attempt this trip if you are not already familiar with backpacking in the canyons of the Colorado Plateau. Hazards and navigation are not the same as other regions, and describing them here is beyond the scope of this article. 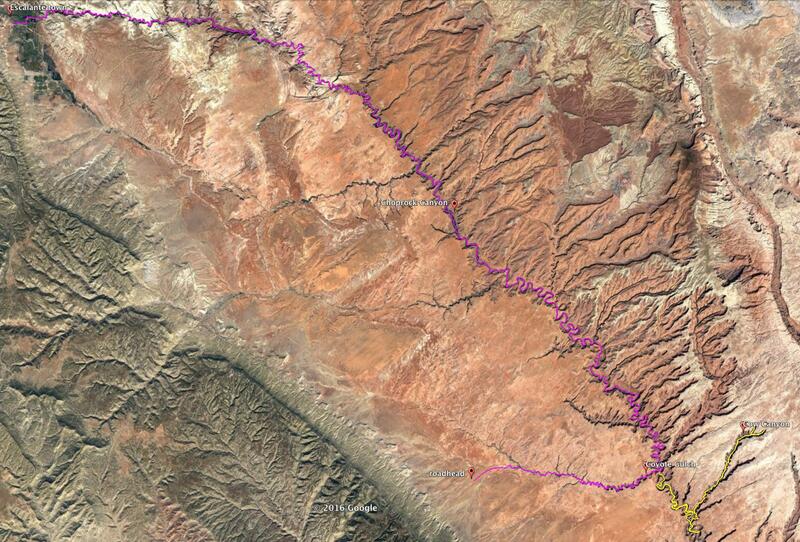 This route is too long and too remote to be a first canyon trip. 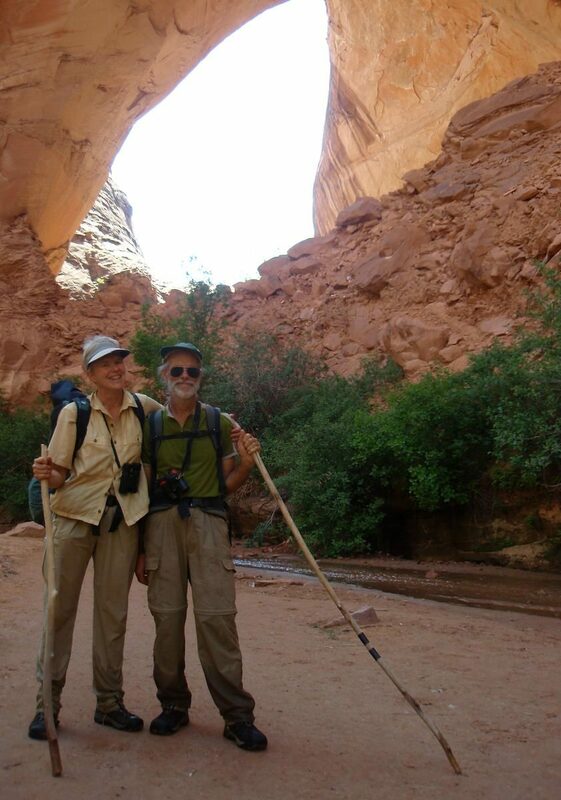 By far the best information on hiking in the region is published by Steve Allen; if you seek how-to information or detailed Escalante route information, you should buy his book Canyoneering 3, Loop Hikes in Utah’s Escalante. 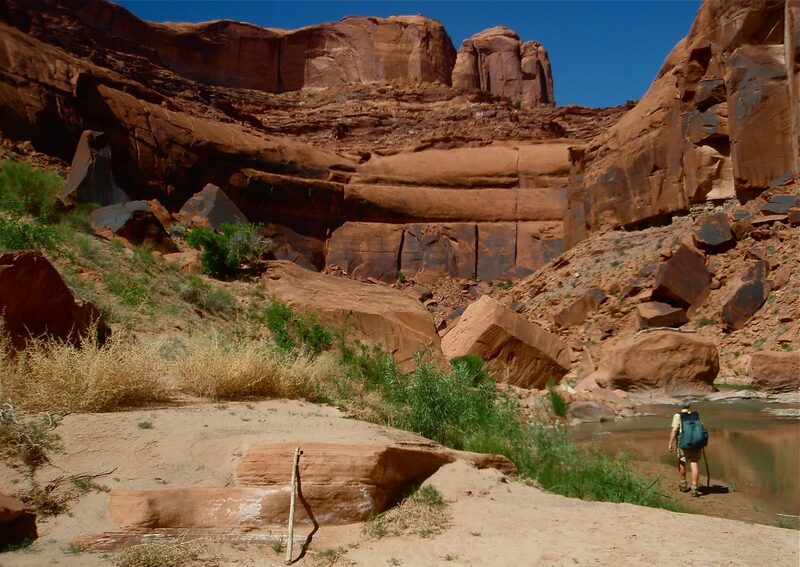 Walking the floor of the Escalante Canyon from town to the confluence with Coyote Gulch varies from fairly straight-forward to challenging, depending on the water level. 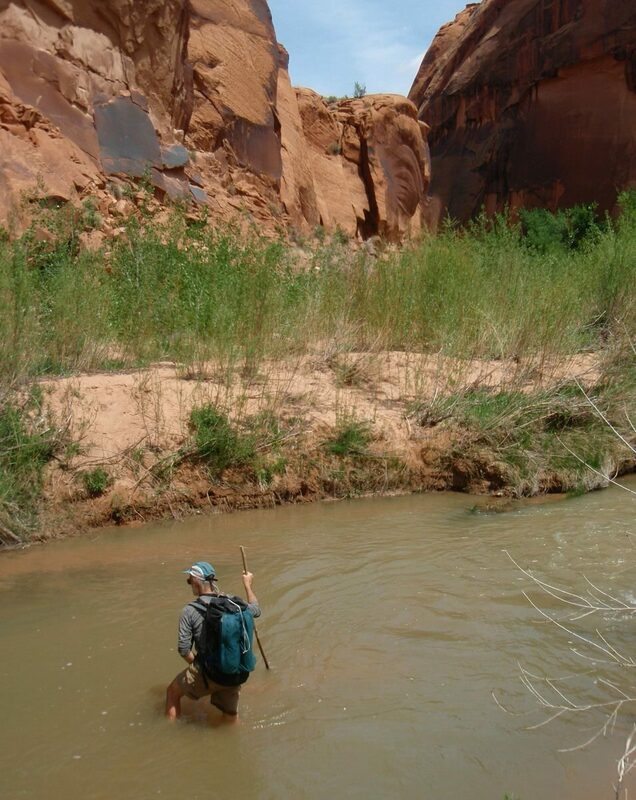 We were lucky on our trip and the river was rarely more than knee deep. 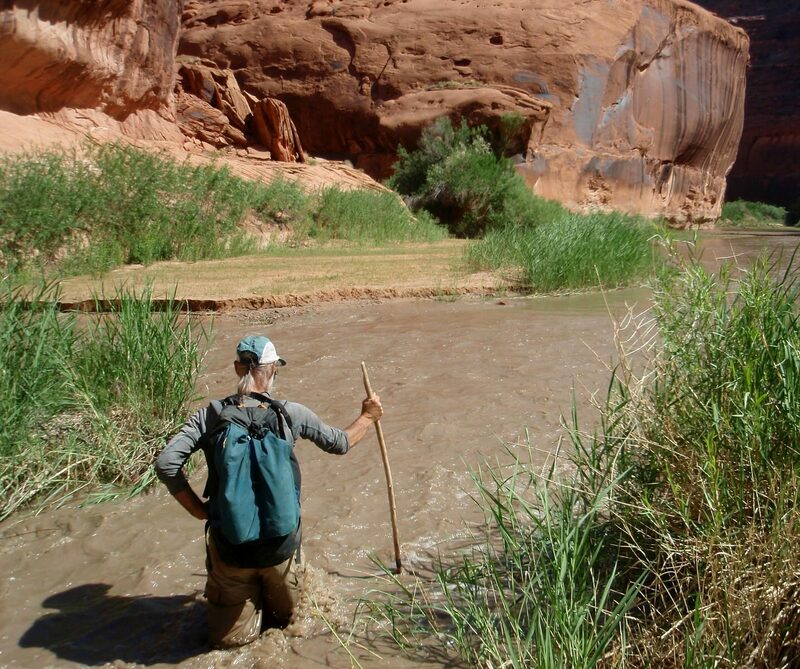 The obstacles we faced between town and the confluence with Coyote Gulch were the expected things: thrashing through willows and tamarisk, frequent stream crossings, avoiding the mucky shoe-sucking holes. We were never forced to leave the river floodplain in order to avoid obstacles so in that sense the route is very straightforward. Our CalTopo map shows the primary route down the river, but except for Cow Canyon, none of our exploratory trips to the rim or up side canyons. 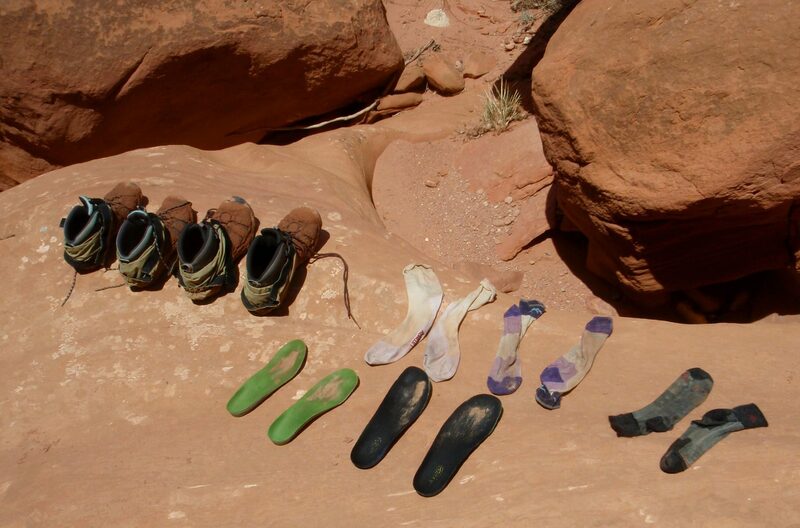 This is intentional as we believe every hiker deserves the chance to discover their own treasures. 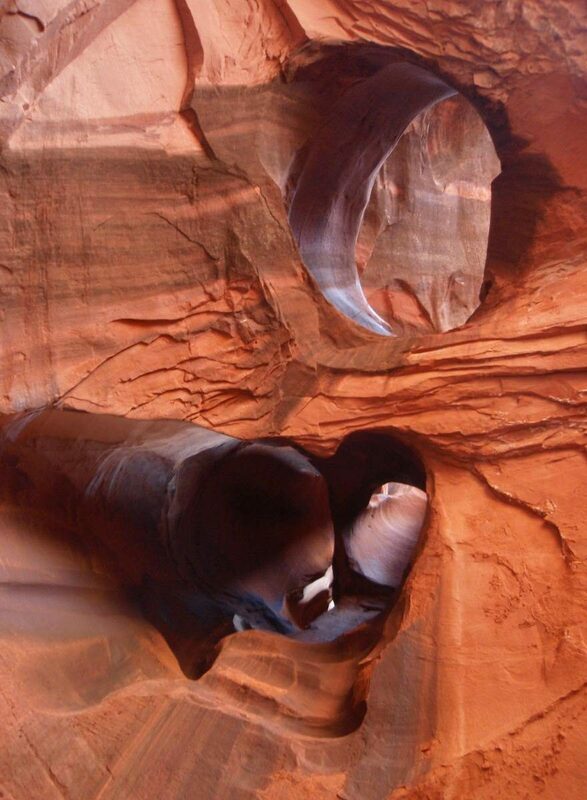 Escalante Canyon is located in the Glen Canyon National Recreation Area. 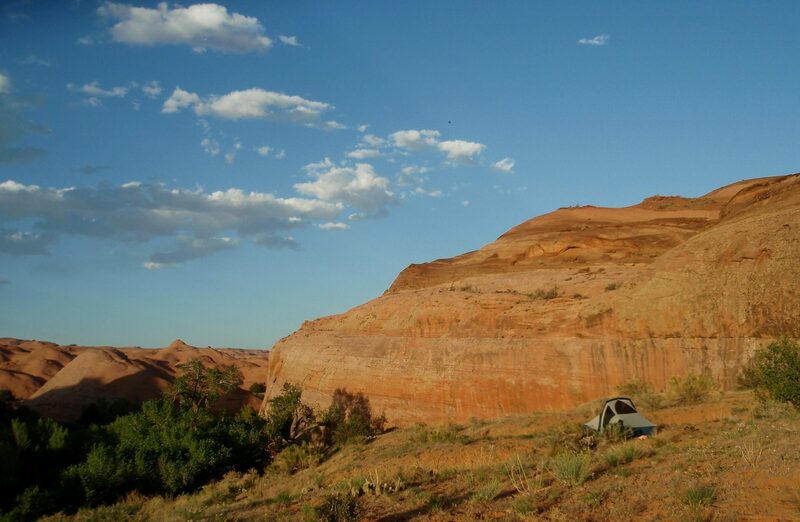 A back-country permit is required and easily obtained at the Inter-agency Ranger Station just west of Escalante. We drove to the town of Escalante and a local gas station gave us permission to park for the duration of our walk. We started our walk in town and crossed some fields to access the river. 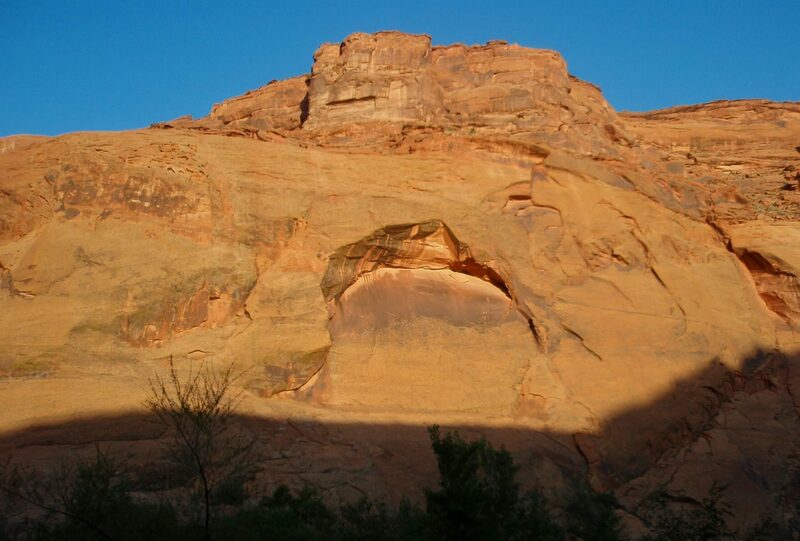 The entrance to the canyon system is a bit over a mile from the center of town. 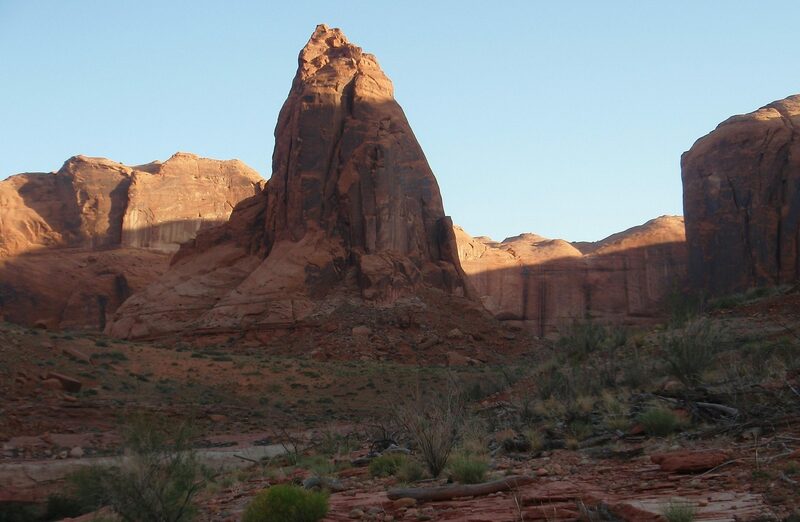 At the end of the trip, we walked up Coyote Gulch to the popular trailhead on the Hole in the Rock Road and easily hitched a ride back to Escalante. 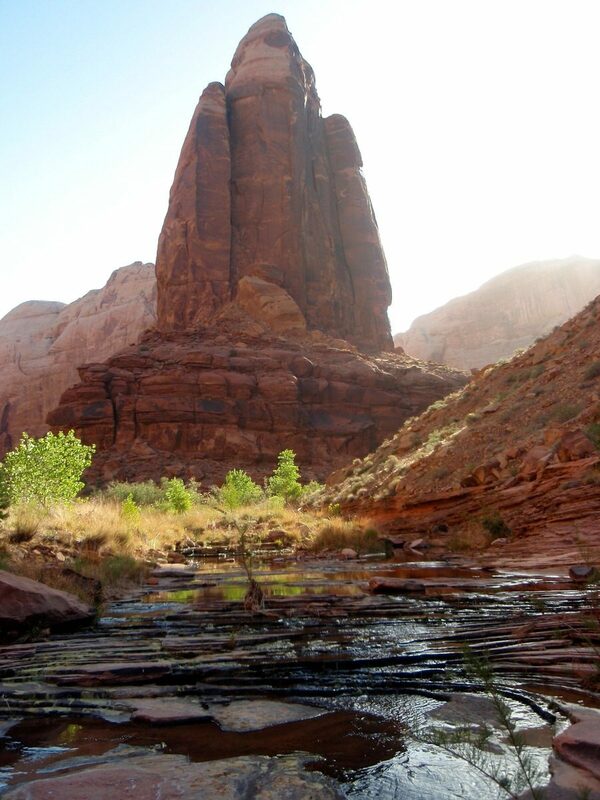 We had not previously walked the river between town and Choprock Canyon, an east side tributary roughly 45 river miles down canyon. 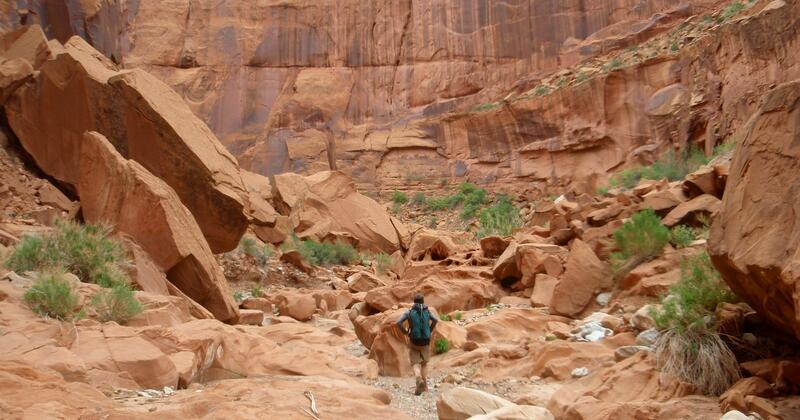 The walking was quite similar to our previous Escalante trips and was very enjoyable. 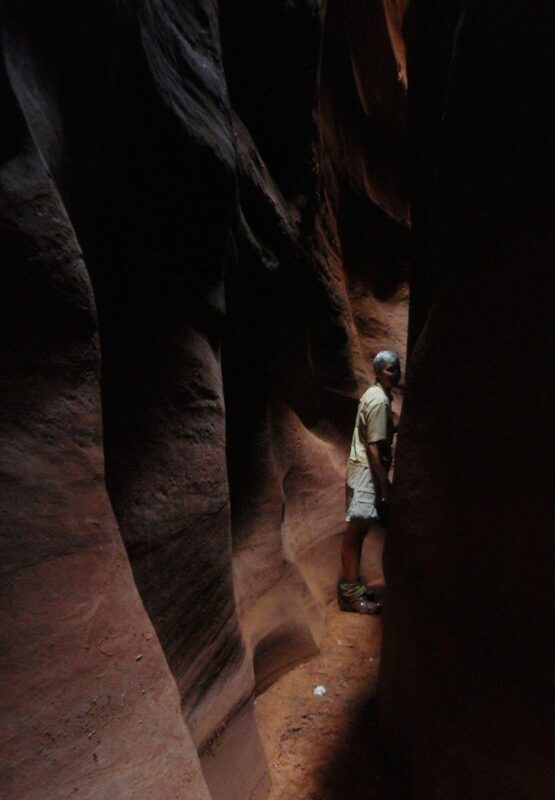 We spent time exploring side canyons and looking for routes to the rim. 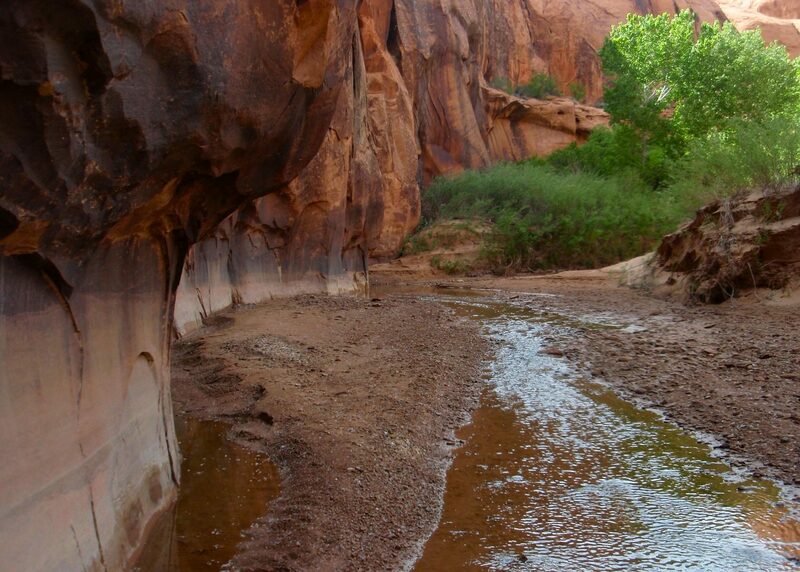 We had already visited this stretch of the river during prior backpacking trips so we did not linger. 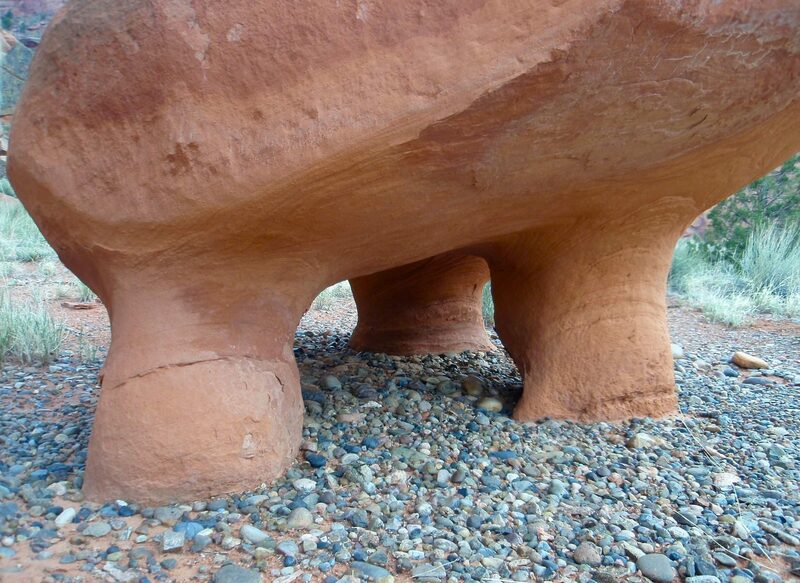 Walking past the mouths of the side canyons we had previously explored brought back many fond memories. 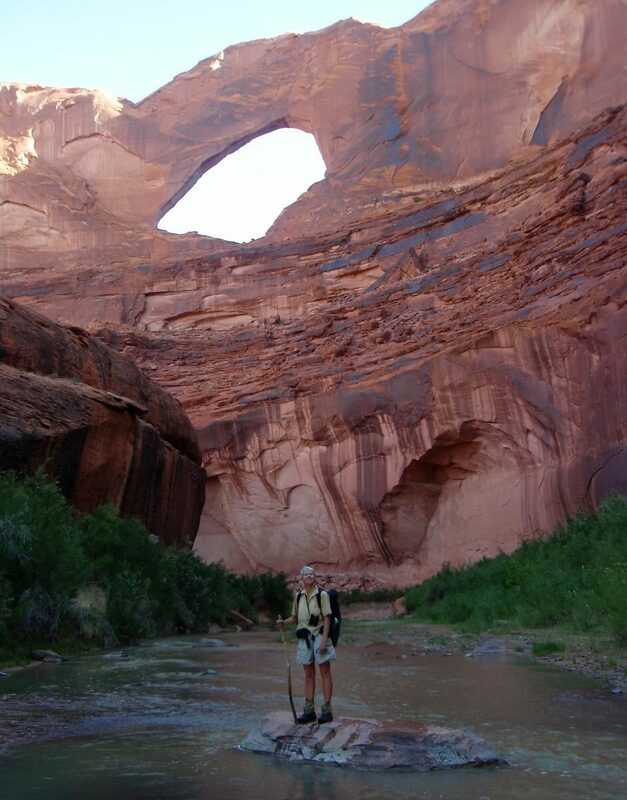 We had not traveled below the mouth of Coyote Creek on previous trips because Lake Powell had flooded the Escalante to near the confluence with the Creek. Because the lake level was down and most of the silt and mud deposits had been washed down canyon, we were able to continue down river. Unlike the riverbanks upstream of the confluence, there were the huge loose bluffs on either side of the river. 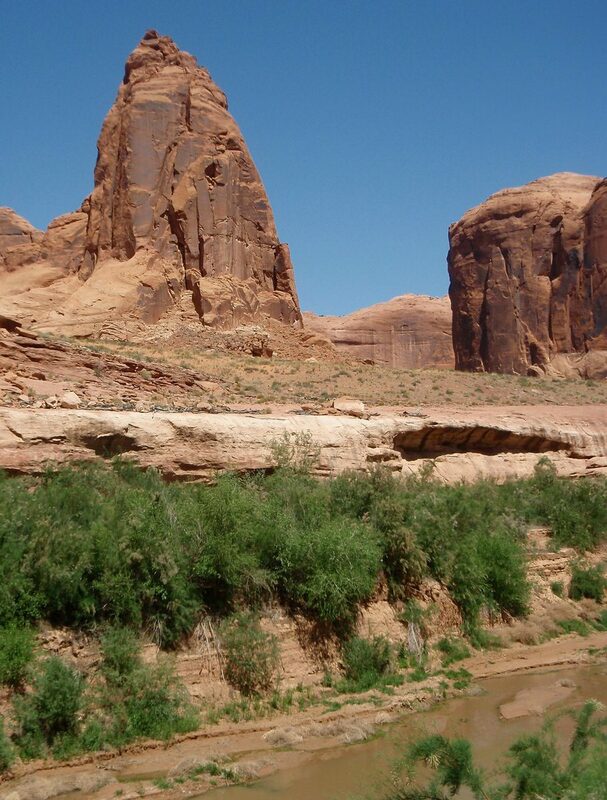 The material in these bluffs are riverine deposits of silt and sand that had dropped out of suspension as the water velocity slowed upon reaching Lake Powell. 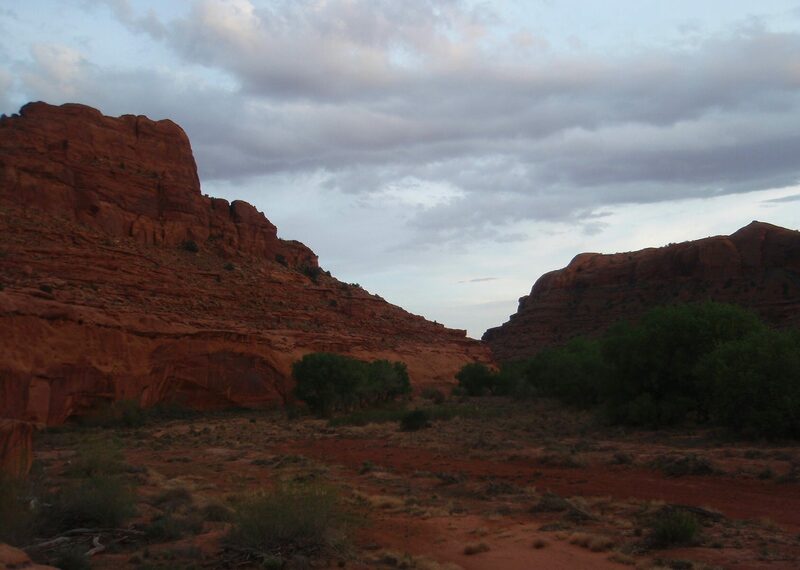 Over time, these deposits filled the entire canyon bottom to lake level and created impassible muck flats. 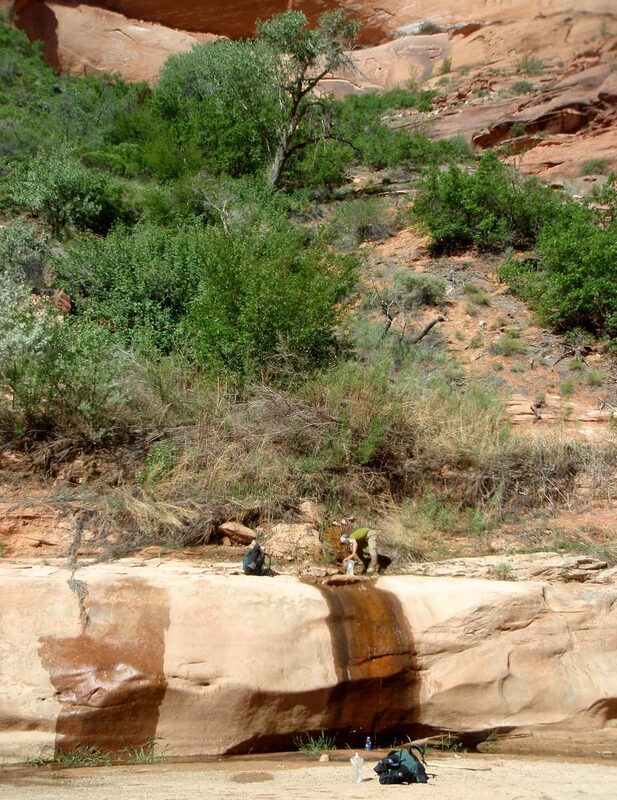 As the Powell pool level dropped, the Escalante easily cut a channel down into these loose materials to the new lower lake level. 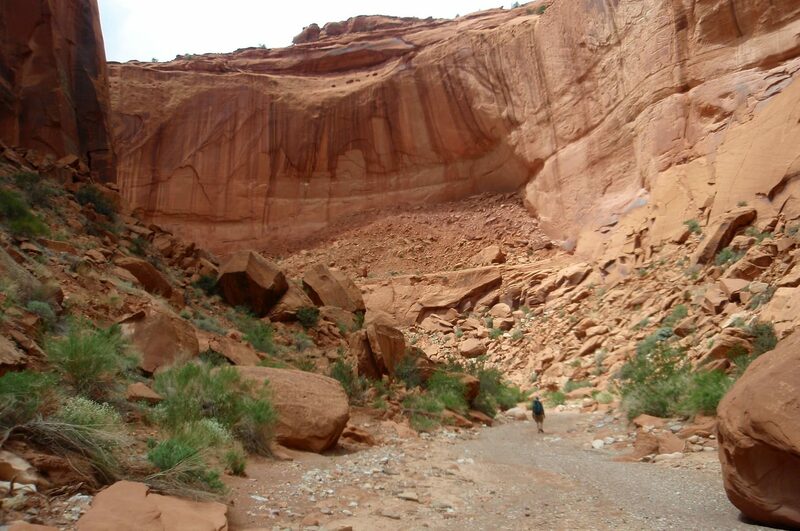 The further down canyon we traveled, the higher the walls of this channel. The sediments forming the walls of the channel were barely consolidated and very unstable. They were steep and loose enough that climbing them was usually impossible and in many places potentially dangerous due to potential collapse if disturbed. 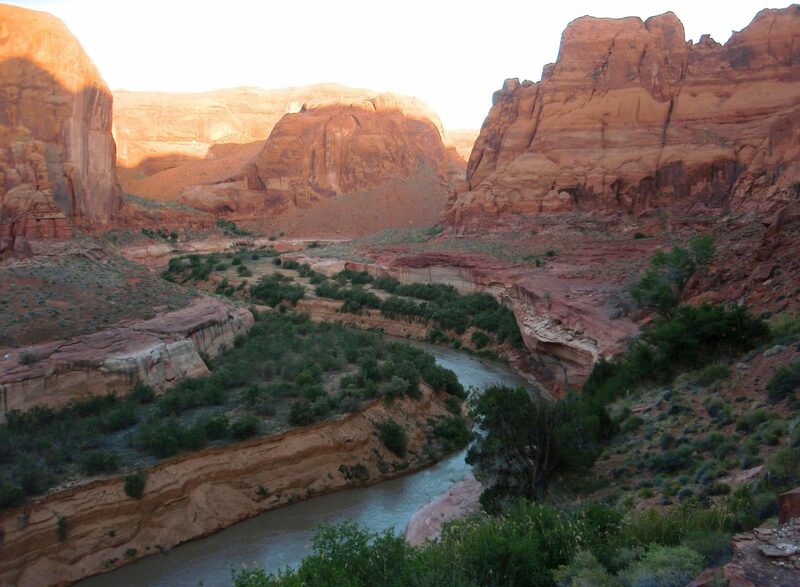 Ultimately these sediments will be washed downstream into Lake Powell and the river banks will re-vegetate, leaving the canyon looking much like it did prior to the building of Glen Canyon Dam. 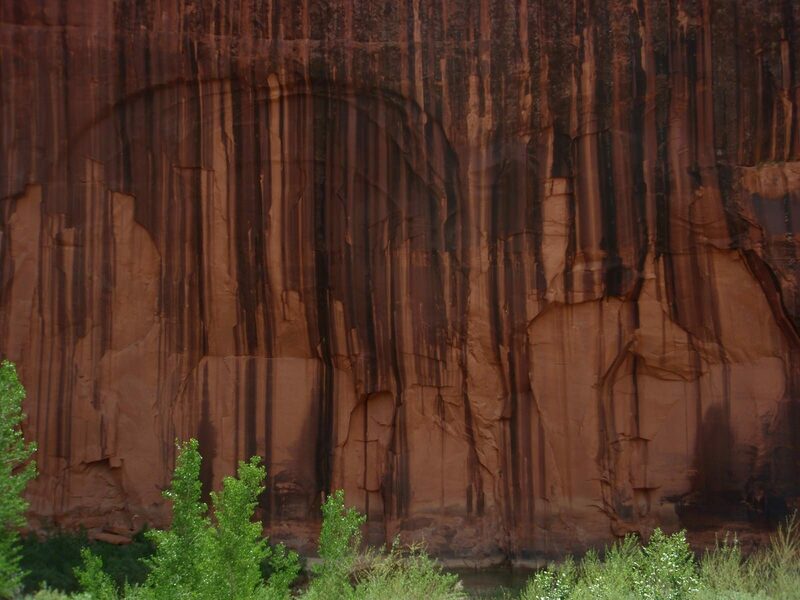 Some of the rock formations in this lower stretch of canyon were visually outstanding. Further exploration is certainly warranted. 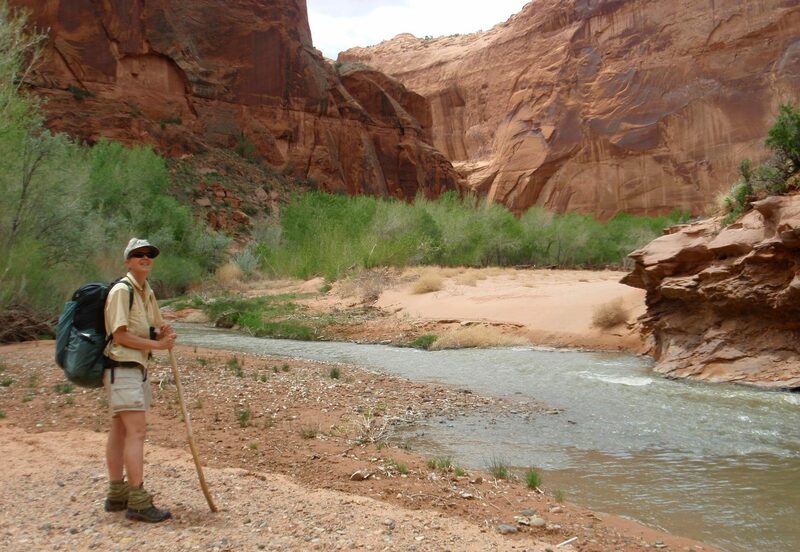 Eventually we reached the new edge of Lake Powell and could not continue further downstream on foot. 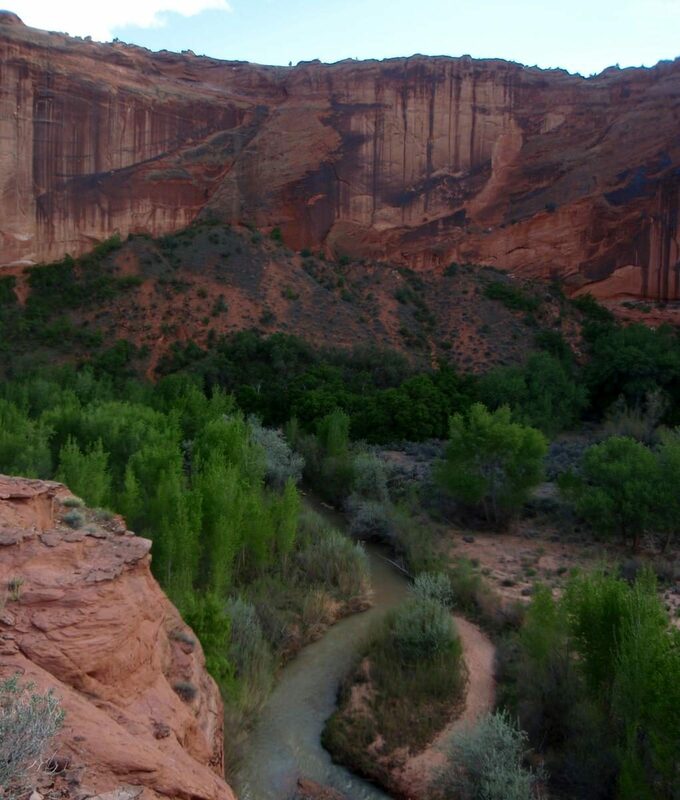 We had passed the mouth of Cow Canyon, a major east side tributary to the Escalante, just prior to where we hit the lake. 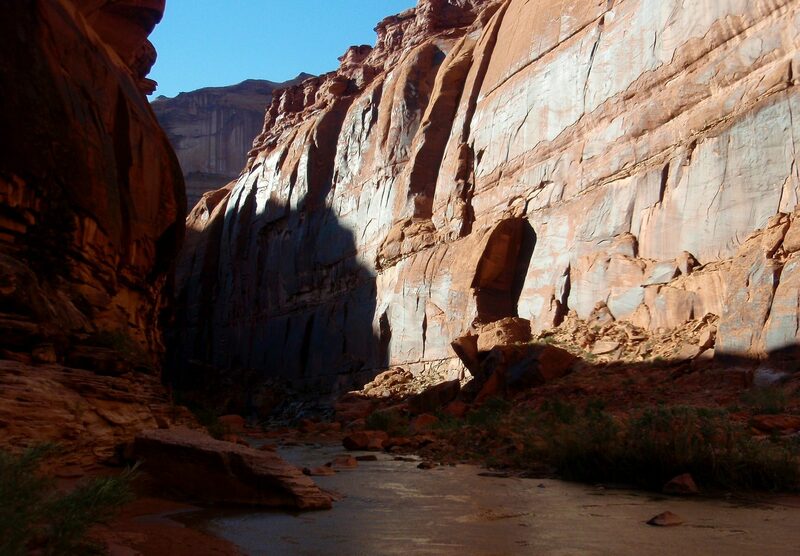 It is extremely difficult to access this canyon from anywhere except its junction with the Escalante. 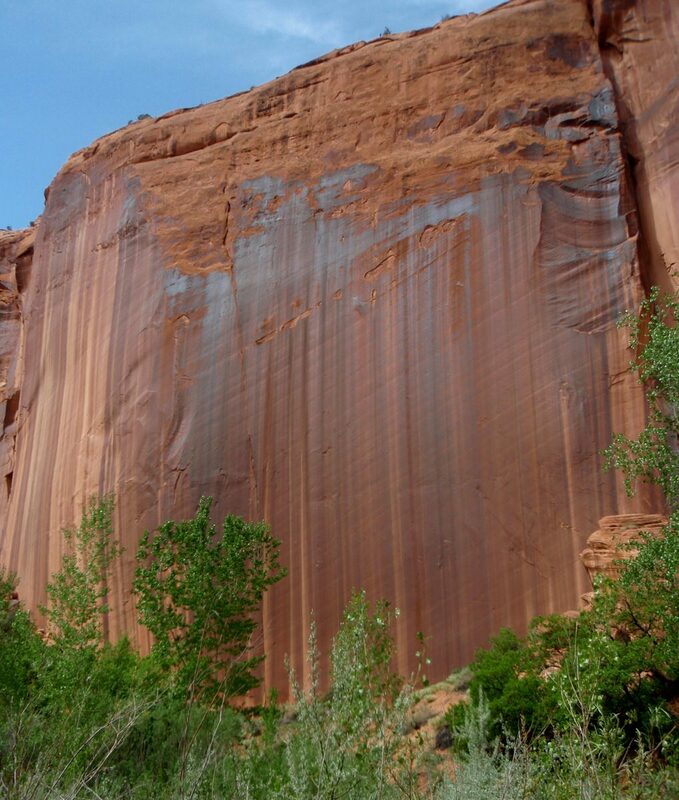 Cow Canyon is deeply cut and has high vertical walls throughout its length. 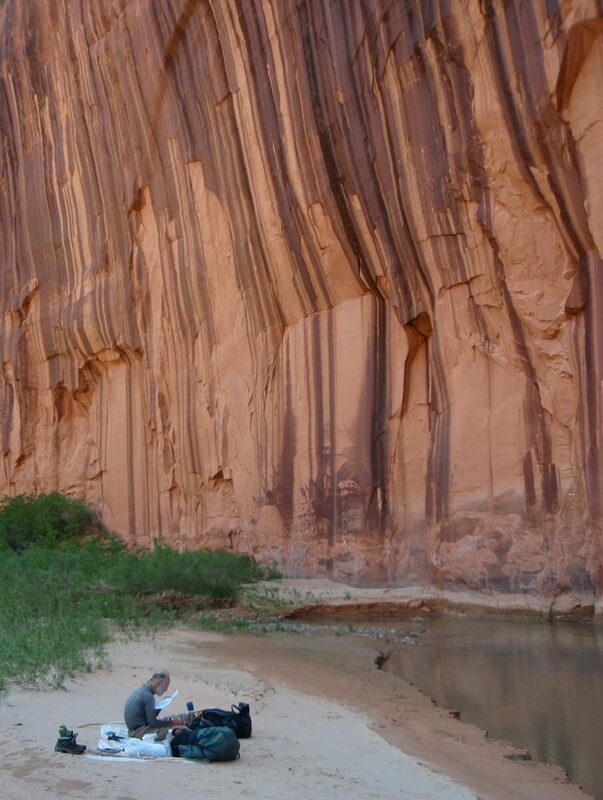 Because of this, almost nobody, except possibly a few people entering via boat from Lake Powell, had been in Cow Canyon since Powell was filled in the 1960’s. 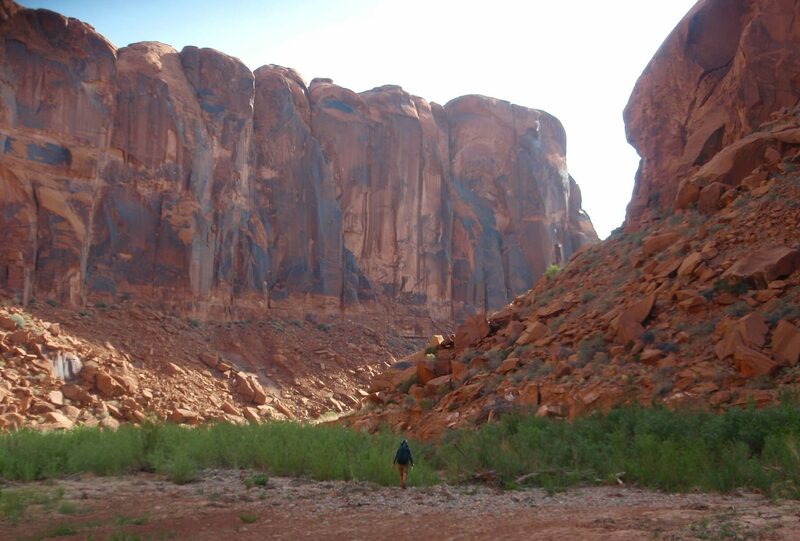 We entered the canyon and spent a full day exploring as far up as the pour-offs at its eastern ends. 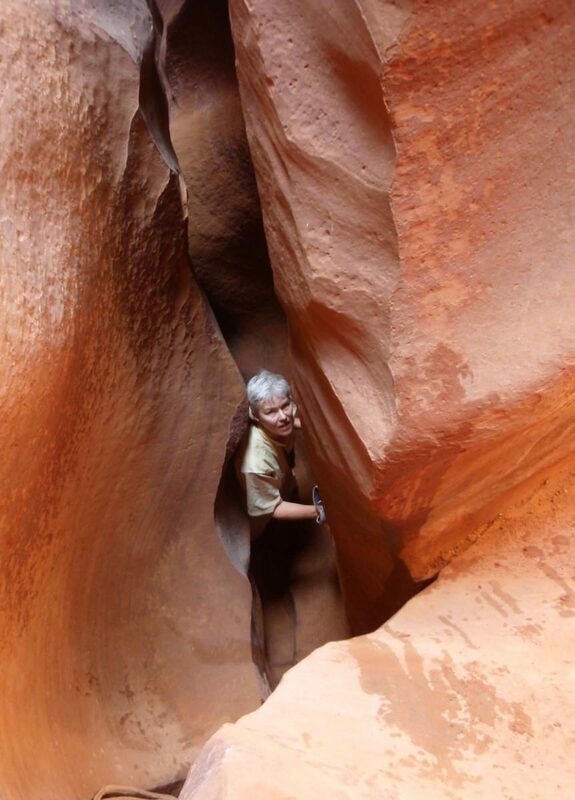 It was terrific being able to visit a canyon that seen neither cows nor many people for at least 40 years. 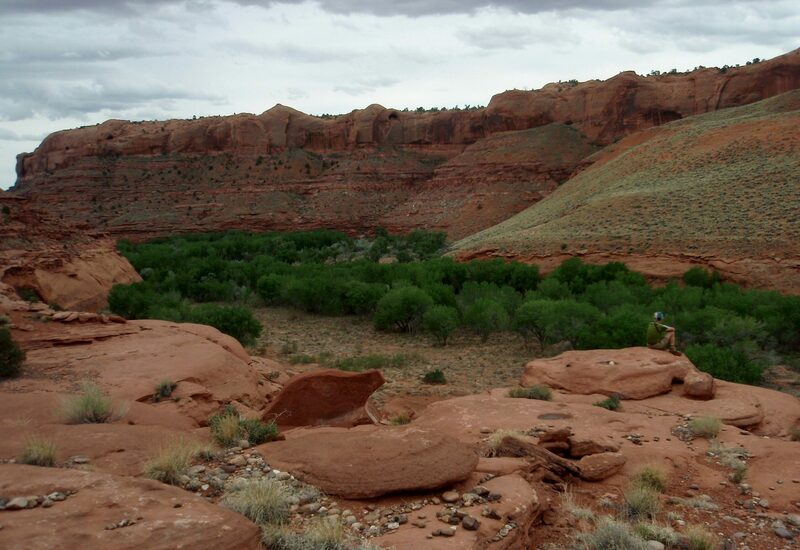 When we started to head back up the Escalante toward Coyote Gulch, we found that the river level had gone up due to rainfall somewhere up river. This meant that travel in the river was no longer possible, as the water was too swift and deep. 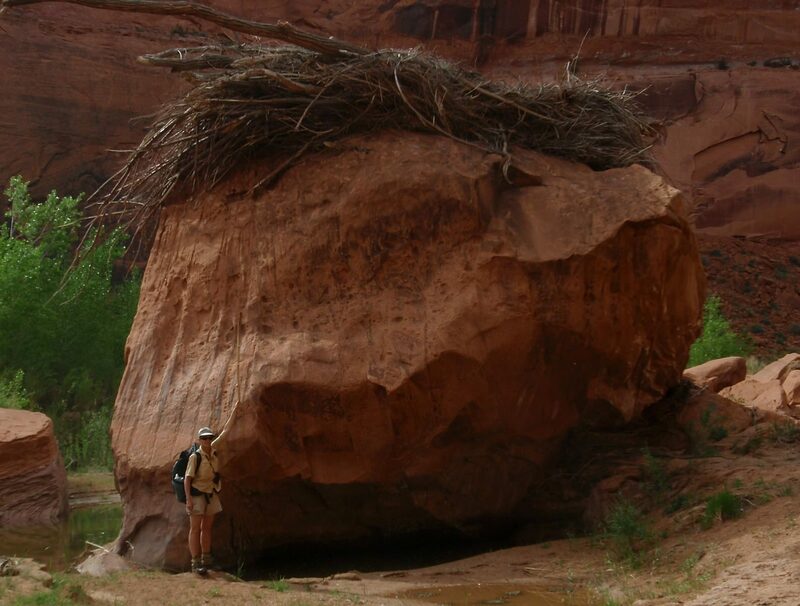 Travel on the shore was also not practical due to the high, steep, and loose banks of silt deposits. 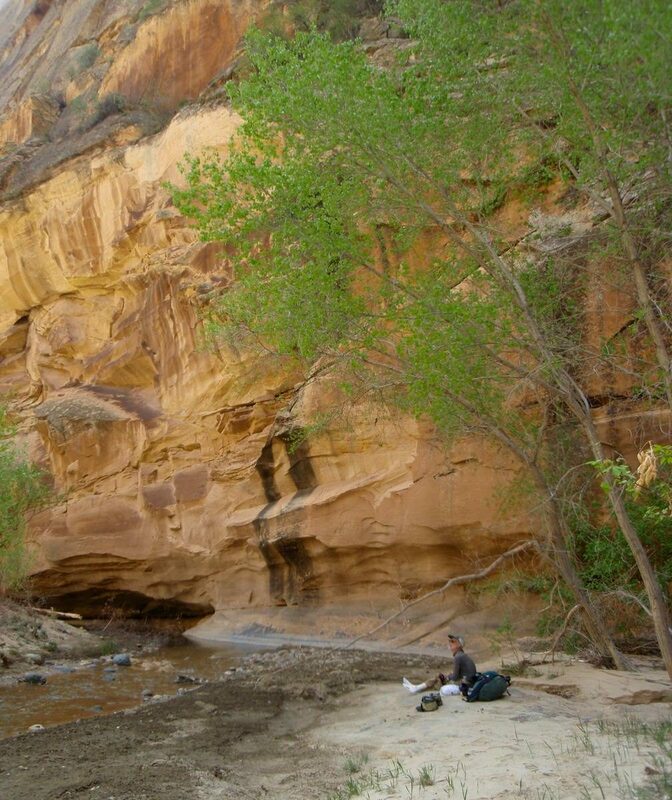 After poking around a bit, we were able to find a place to climb up to a bench high above the east side of the river and continue on that until the river level had dropped enough to enable us to drop down and travel upstream in the riverbed. The other option would have been to wait for the water levels to go down. We walked out Coyote Creek to the Hole in the Rock Road. 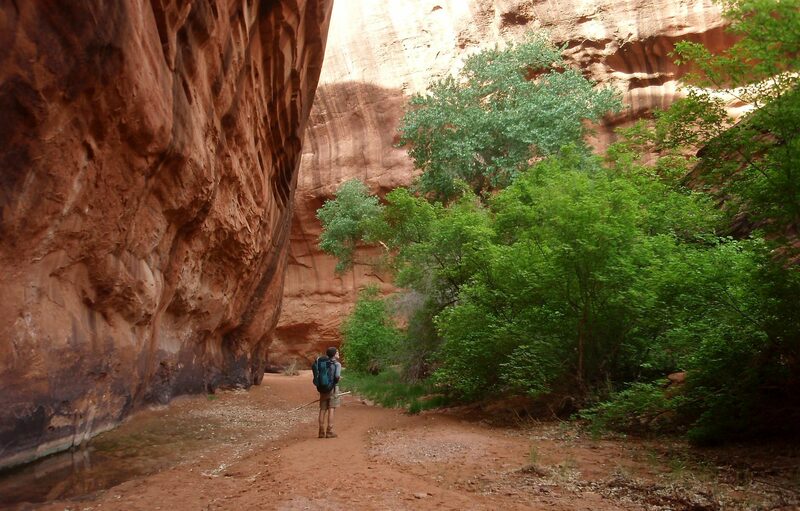 There were many people out on day and overnight hikes in this popular side canyon.